I’ve had the pleasure of watching this street wise Chessmaster in action on many Saturday afternoons. With a modest set up of a cardboard box that serves as a table and small crates for seats, he challenges random passersby to a friendly dual of quick wits. I was curious to learn more about the humble chess player and discovered a news story that revealed that the player is self-taught and rarely loses. I was surprised even more to learn that he developed his chess skills by often being an opponent to himself. 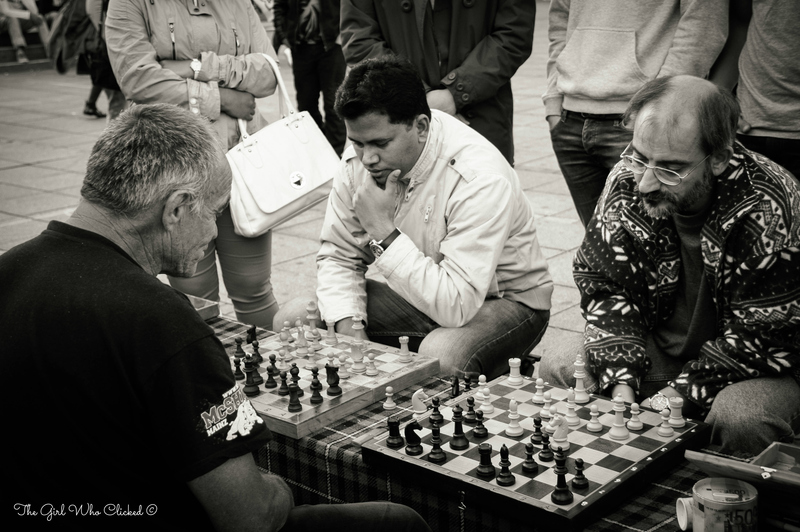 This particular Saturday, he masterminded chess strategies for two games that took place simultaneously. It was great to capture the intensity of the competitors in the heat of the battle. Unfortunately, I did not stay until the end to see the victor, but I’m looking forward to watching a new game this Saturday.